The post Black model gets fired from agency after proudly attending pro-Trump conference appeared first on theGrio. Thanks to right wing pundits Candace Owens and Tomi Lahren, there seems to be a new social media feud blowing up this week. The post Candace Owens tells Tomi Lahren ‘you’re a vile human being’ in Twitter brawl over Kanye West appeared first on theGrio. 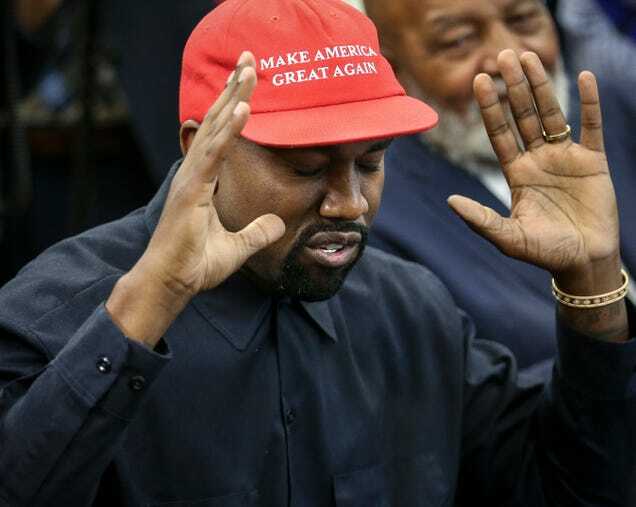 The post Kanye West breaks from Trump’s policies in Twitter rant: “My eyes are now wide open” appeared first on theGrio. How would you feel if a member of your family was killed, and in the aftermath of their death, everyone from the White House to Sarah Huckabee Sanders, to even GOP talking heads used them as a talking point—an afterthought—in the ongoing debate about immigration in this country? Conservative Trump supporter Candace Owens appeared on MSNBC with Ari Melber Tuesday evening and the conversation went left pretty fast. The post Trump supporter Candace Owens has epic meltdown on live tv debate with Michael Eric Dyson appeared first on theGrio. MSNBC host Craig Melvin didn't hesitate to challenge conservative firebrand Candace Owens on her claims that the left uses "fear mongering." In a weird turn of events, West proclaimed his love for President Donald Trump. The post Kanye West to Hot 97’s Ebro: “I Love Donald Trump” appeared first on theGrio. Don't fall for Kanye's seeds of “wisdom” he's been spreading upon the masses. The post What to do with Kanye West’s sunken place tweets and his upcoming (allegedly) dope music appeared first on theGrio.